Dozens of fires throughout Tuesday attributed to heat wave, tourism influx. 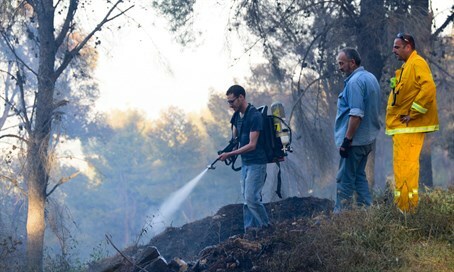 Israeli firefighters have contained three major brushfires throughout northern Israel, they announced Tuesday evening, after dozens of teams and firefighting planes were called to battle the blazes. Three major fires were reported in Gan Yavne, Emek Yizrael, and the Western Galilee earlier Tuesday, with over 20 firefighting teams and 6 firefighting planes dispatched as part of the firefight. Hundreds of dunams have been scorched, including banana fields. Earlier Tuesday, yet another fire was reported in Nahariya, on HaHagana St.; several apartments were set ablaze. Two fires also broke out in Jerusalem, on the Mount of Olives and the Shalom Forest. None were reported injured in either blaze. Several factors have been attributed to the fires' cause, including hundreds of thousands of tourists flooding Israel's national park system and average temperatures as high as 39°C (102.2°F).